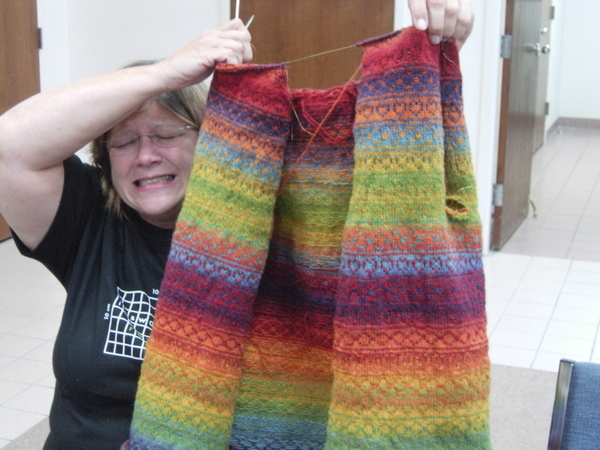 My mission, should I choose to accept it, is to knit all of the things I have listed before December 31st, 2008. If I should fail in this mission, the government, and most of my knitting buddies, will disavow any knowledge of me or my whereabouts. To this end, this blog will self destruct at midnight on New Years Eve 2008. Good luck, Jo! 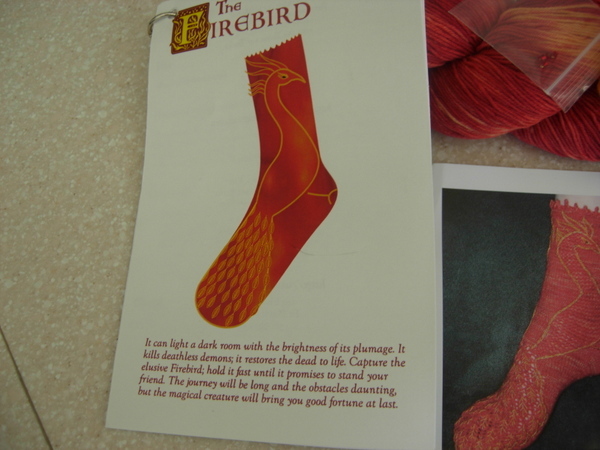 Despite the Yarn Harlot's attempt to derail all sock clubs by knitting Vintage Socks, the mill finally came through! The yarn was dyed, skeined, packaged and.....SENT! Say hello to Firebird! You've got to give our lovely Tsarina of Tsocks her props! This pattern is absolutely fabulous! I can't wait to start! Different textures, plus embroidery!?! WTF!?! I have a feeling that this one may take a while! Whether it takes a month, or a year, the color is fabulous! 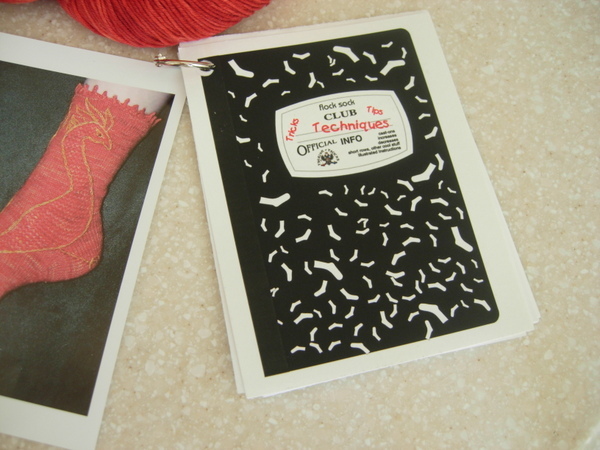 And check out the lovely little helper book! And, just to prove that it can be done, a picture! They don't call her the Tsarina for nothin'! Serendipity is the Mother of Obsession! Several months ago, my eldest DD bought me yarn and needles. She bought it for my birthday. She bought it because she loves me and, unlike others that live with me (who think I have all the yarn and needles in the universe), believes me when I say that what would please me most would be a gift of yarn. She shuffled off to several LYS's in Austin. She asked alot of questions. She talked to my friends to find out what I might like. And she did a VERY good job! She bought Addi Turbo Lace needles (which I did not have). 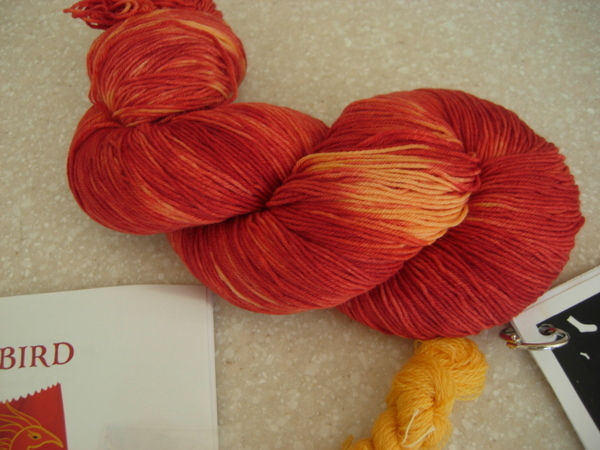 And she bought me....MALABRIGO LACE! I asked for more of this yarn, so I could make an actual project! She managed to find two more skeins, in the same colorway! The result is my new obsession! 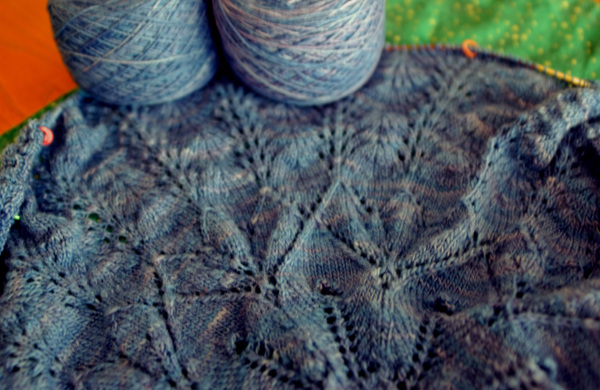 This has to be the most addicting yarn on the planet! 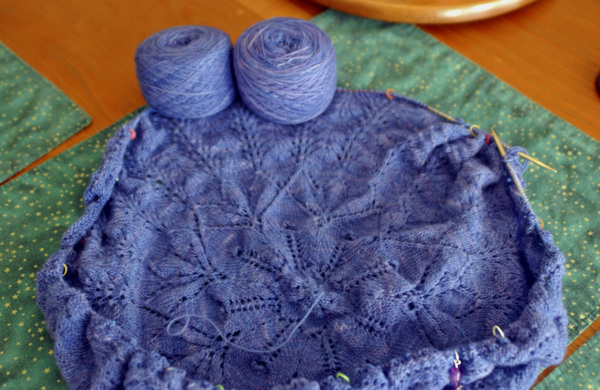 The Feather and Fan pattern is fabulously easy, and, even with the tendency of lace to look like the dog's dinner until blocked, when it is spread just a little bit, you can see the loveliness that is Malabrigo! I owe apologies to Ms. Violet! I thought she was simply being dramatic when she said it cured eczema! Hell, this stuff could cure anything! I'm on row 104 and have just about used up one skein...but it is growing by the row. 600 stitches. I think it grows to about 1400 stitches in the end. But I still great big huggy lurves it! 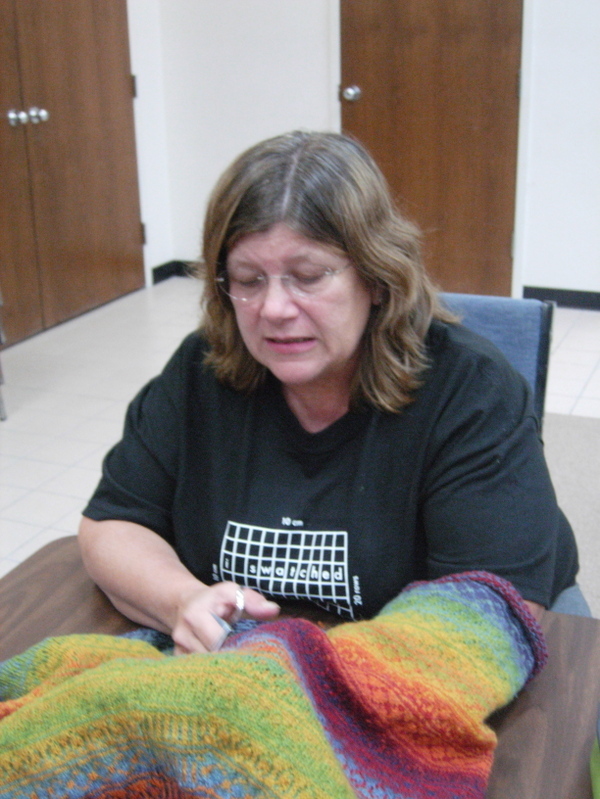 For those of you that are on Ravelry, get thyself over to the Mission Possible message boards. The idea (and it is a great one) is to commit to finishing 12 things before December 31st, 2008. I announced my list there, and will repeat it here (where it can haunt me I can see it. 7. I will finish Dunadd! This year! 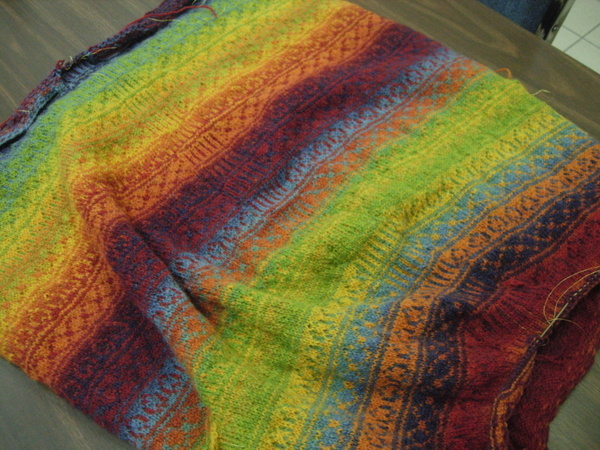 I really love the pattern, and the yarn, but the darned thing is getting too big to haul around with me! I don't get great big whacks of knitting time at home, so I work on things that are less complex, like socks. And the insanity that is Malabrigo has taken up a lot of knitty concentration! 8. Wash, card and spin my alpaca fleeces! 10. 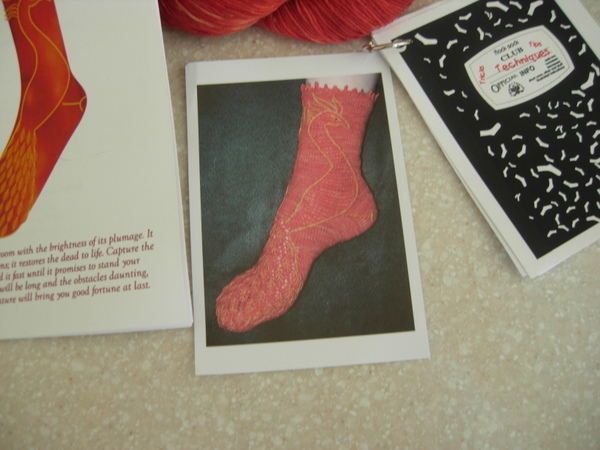 Spin one "Sheep to Shoe" kit and knit the sock! I don't think that this will be a problem, unless the serendipitous DD goes back to the Knitting Nest for my Mother's day present. Anything worth doing is worth doing in a cold sweat! Much work has been accomplished Chez Sheep, as one might surmise by my conspicuous absence from the blogosphere, despite NaBloPoMo. Yes, I faithfully promised. Yes, I utterly failed. That being said, I actually have done some knitterly things! Work has been, well, WORK! But, again, the benefits of being on call is at least some knitting time. And what does knitting time mean? It means progress!!! 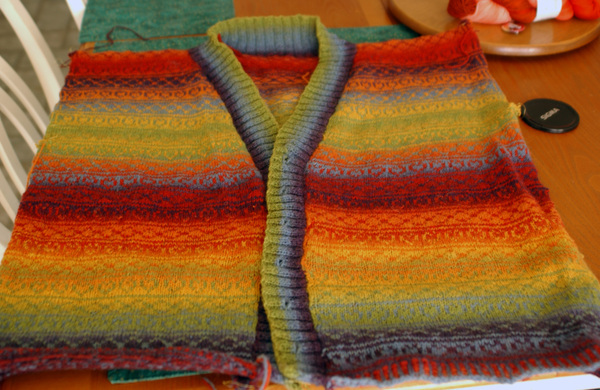 Specifically, progress on the Kauni Cardi! They said that I turned really pale. I thought they were kidding, until I saw this picture. Rather "flu"ish, I'd say. I don't think I took a breath the entire time I was cutting! But the end result was positively majik! Now that I can breathe again, I'll give you the short version of life here. Our fiber group (the one we spun with at the Archaeological Fair) has solidified, and we are officially named "Interwoven". (I wasn't really pleased with this, as it is too much like "Interweave", but I was outvoted.) I particularly wanted S.W.A.T (Spun, Warped and Twisted)! We may be somewhat unique, as we are officially under the auspices of the County extension office (yes, the people who deal with Ag Ed!) And because we are associated with the County Extension office, we are also associated with Texas A&M. (My little Longhorn is groaning! Rest assured that I will have no qualms about rooting for Texas in the game on Friday, however!) 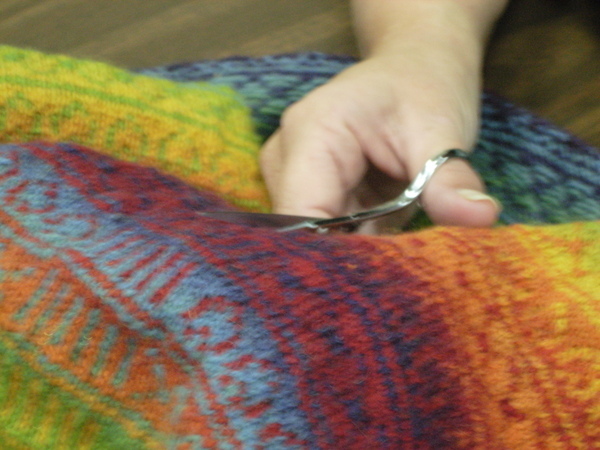 The plan is to study and provide community education about the fiber arts. Now THAT is very cool! And the diverse areas of expertise represented by these women and man (yep, the husband of one of us!) is AWESOME! Some of these women have llama, alpaca and CASHMERE GOATS!!!!! Now, if you can imagine anyone confessing to a room full of fiber addicts that she has about a hundred POUNDS of cashmere fiber to be processed, and NO ONE HYPERVENTILATED (except me!)!!!! And, if we play our cards right, we will have access to some fiber from prize winning sheep, goats, llama, alpaca (and maybe somewhere, a vicuna???) from the Ag Ed departments of our and neighboring counties! WHEEEE! I'll teach anyone anything that I know for a crack at some fiber! I've already learned so much from our spinners! I'm actually making something from my first handspun, which I will post later so prying little eyes can't peek at it! (Can you spell "Christmas knitting?") And our "guy" member is incredible. He picked up drop spindling in about 10 minutes. When he started having trouble with the bottom whorl spindle, I brought him a top whorl to try. The next Tuesday, he shows up with his own top whorl spindle, made from 2 CD's, a dowel, hook, grommet and washer! Grommet and washer, you say? Yep...that makes it a convertible spindle....top or bottom whorl! He was discussing dissecting a bicycle to make his wife a ten-speed spinning wheel! We heart him lots, too! All in all, a very interesting group!